I have been a member of the SHS Section for most of my IAFC membership. I am encouraged by the influence the SHS section has on the fire service, and as such, I value the work this section accomplishes on behalf of all firefighters. 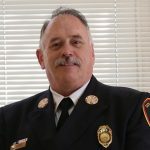 I have been the Chief of the Meriden Fire Department for the last 5 years. I have almost 40 years in the emergency services, 30+ in the fire service. I have worked on both large and medium career departments as well as volunteer fire departments. I am and have always been an advocate for fire fighter safety. I and have several published articles which reflect issues addressing unusual safety issues. Most recently, I wrote an article about taming the beast, reflecting on the need for our membership to get involved in passing on the safety knowledge. In my own organization successfully lobbied for ergonomic PPE, PPE washing equipment, and a two hood policy within our department; at the state level for a Cancer Bill for firefighters and our current project, extending the cancer prevention/Bio-Hazard platform with uniform washers in each station. I am excited to represent the SHS section members on the board. We work diligently at promoting the science of fire safety through advocacy for all firefighters to have annual physicals, cancer prevention and a global approach to safety. I would like to continue with our efforts and I am asking for your vote so I can continue to our campaign for firefighter safety.